Mike Hadley, the WHR Group’s Projects Manager and a committee member, has been awarded the Welsh Highland Railway Society’s Token of Appreciation for 2018. The award was instigated in 2003 as a symbol of the Society’s gratitude to an individual member or group of members who had made an outstanding contribution to the Society and/or Railway over the preceding year. The recipient is chosen by the Society’s board of directors and can be nominated by any member. 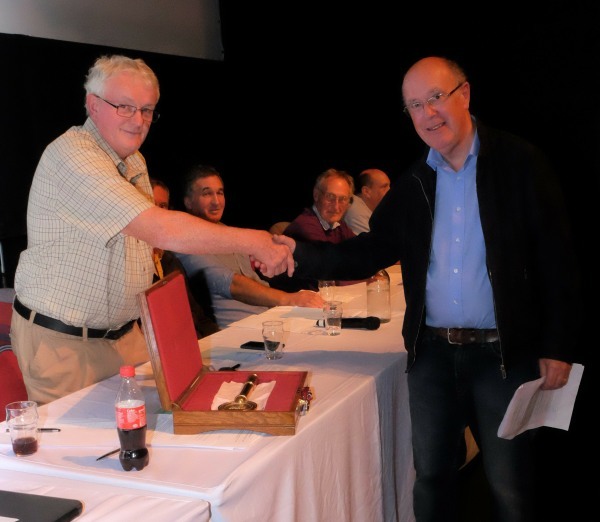 The picture shows Mike receiving the award from the Society Chairman Dafydd Thomas at the Society’s recent Annual General Meeting. The award is a half size replica of the original Welsh Highland Railway Snowdon Ranger to Rhyd Ddu (South Snowdon) single line token.